- Date: 05/2018, Seed: $2.3 M (post valuation: undisclosed amount). Worlds largest crowdfunding festival One Spark voted PikMyKid as the most promising education company. We all can agree that every school needs to be a safe and secure place for our children. This means a closed campus with access controls and restricted entry points. Yet, when 2.30 pm rolls around, we open all the gates and let students stream out into the corridors and allow unrestricted access to any one who chooses to enter the campus. Since a chain is only as strong as the weakest link, schools with the best security systems are vulnerable if they do not have good dismissal protocols in place. A good dismissal process not only ensures the safety of children but also reduces liability for schools. Keeping parents alerted about their children’s status during daily dismissals and also having a plan for emergency reunification after a crisis can be one of the most challenging tasks a school can be faced with. 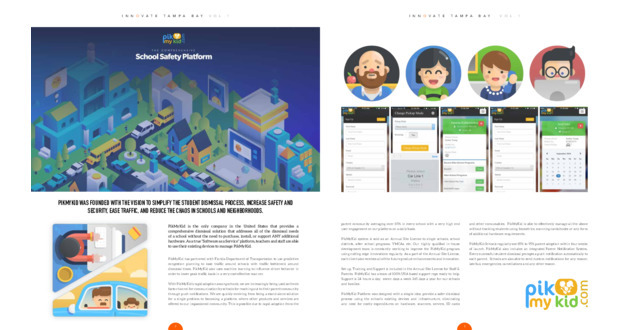 There are many low hanging safety issues which can be resolved using cost-effective technologies and PikMyKid does precisely that. 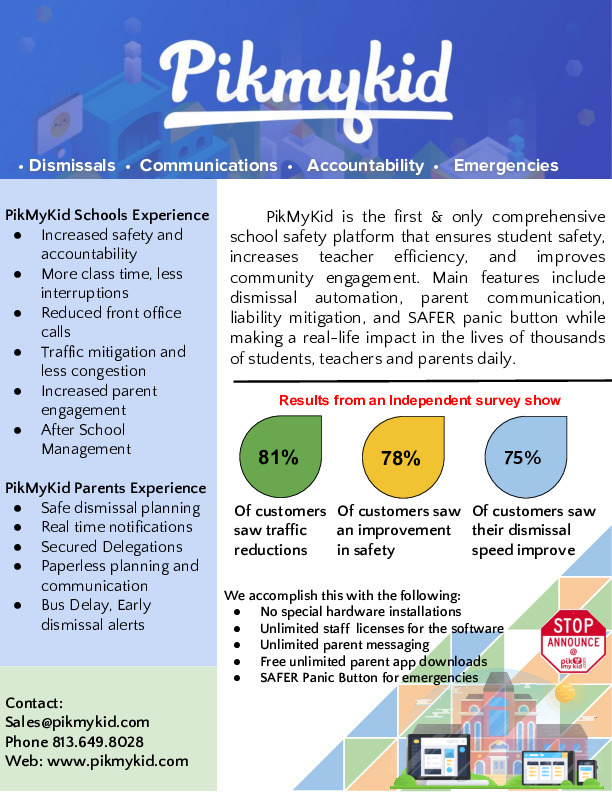 PikMyKid is a comprehensive school safety system that ensures student safety and increases teacher efficiency while engaging over 85% of the parents & reducing traffic around schools. Main features include- dismissal automation, parent communication, liability mitigation, Panic Button and SMART Feeds. 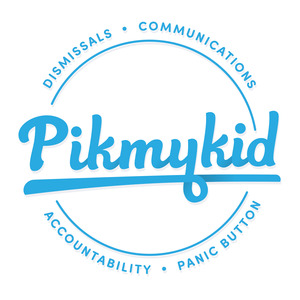 PikMyKid is a Florida based company, currently in 26 states and 5 different countries with over 200,000 users. 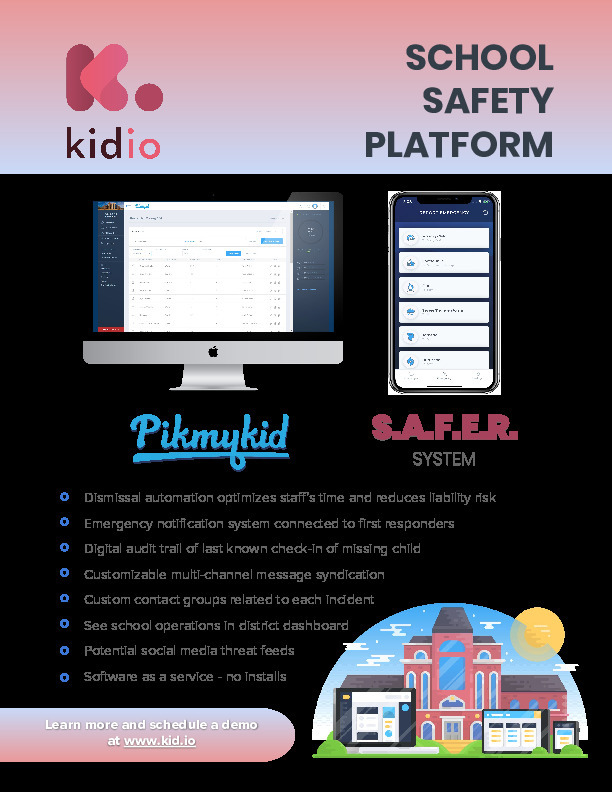 PikMyKid is the First and Only Comprehensive School Safety Platform that ensures Student Safety, Increases Teacher efficiency while engaging >75% parents and reducing traffic around schools. In a short 3 years since launch, PikMyKid today is in 26 states in the US and 5 different countries with over 200K users. 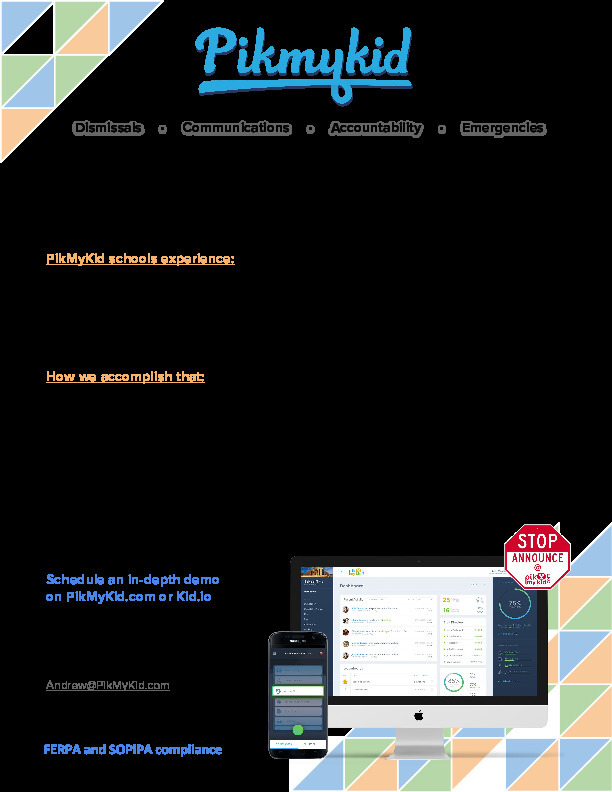 PikMyKid addresses all the safety loopholes in the school system today using cost-effective technology and thereby providing a safe learning environment for students while increasing parent engagement in schools. The PikMyKid parent application has an average parent adoption of over 75% in every school, making real life impact in the life of hundreds of thousands of students, teachers and parents daily! The reason PikMyKid’s rapid adoption across the country is because of its innovative design and technology architecture which dramatically reduces the cost of adoption. There is no additional hardware to buy, no on-site installations or expensive training costs. The application is completely cloud based, platform agnostic with a simple and easy to use interface for teachers and parents. 1) How do your most troubled schools handle their dismissal now? 2) Do you intend to reduce liability and improve accountability for bus riders & walkers? 3) Do you experience traffic around school neighbourhoods during school drop-off and pick up times? 4) Are you looking for a comprehensive school safety solution which handles multiple aspects of safety? 1) What challenges are you facing during dismissal? 2) How many school staff are engaged in the dismissal process? 3) Is rainy day or snow day dismissal any different and how so? 4) Do you have an efficient method of communicating with your parents? 5) Do you have a Panic Button system for all school staff during emergencies? 6) How do you handle dismissal changes, custody issues & delegations by parents? A chain is only as strong as the weakest link, similarly schools with even the best access control systems are vulnerable if they do not have good dismissal protocols in place. A good dismissal process not only ensures safety of children, but also reduces liability for schools. Keeping parents alerted about their children’s status daily during dismissals and also having a plan for emergency reunification after a crisis can be one of the scariest and yet most challenging tasks a school can be faced with. Teacher’s time on the other hand is one of the most stressed resources most schools face. 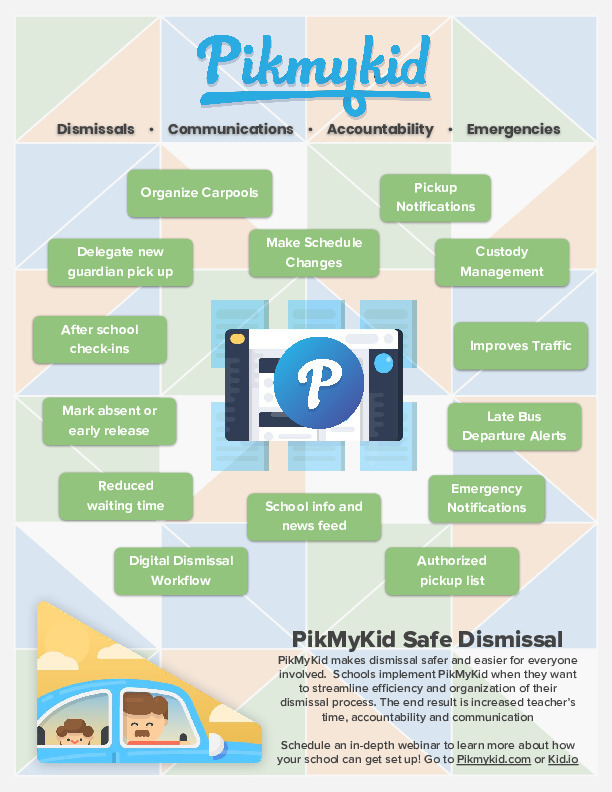 With PikMyKid, teachers have one less thing to worry about at the end of the day - (the safety of their kids) getting kids home safely. An independent study conducted by University of South Florida concluded that PikMyKid saves in excess of $40,000 worth of teacher’s time per year per school by the efficiencies we bring using already existing technologies in the school. and communication between parents and teachers during any emergency. a) Topline pricing is $1/student/month for 10 months of the school year paid annually. Eg- 500 students would cost $5000 per annum. c) This annual price will include implementation & training costs of up to 6 hours of remote support per school. It will also include free parent app and unlimited parent app support for the entire year. Parent can do the schedule changes online that sends real time alert to the school staff. Teacher can download a end of dismissal plan that shows all the latest changes. School’s insurance policies charge premium based on their student accountability procedures and safety protocols in place. Reduced Insurance premiums, Funding PMK through Insurance grants and better safety records.